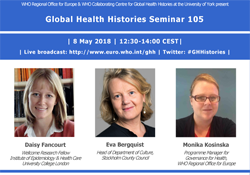 WHO/Europe | Global Health Histories: seminar on Cultural contexts of health and well-being: Can art save lives? Media centre Events Global Health Histories: seminar on Cultural contexts of health and well-being: Can art save lives? If medicine is an art, can art be a medicine? Increasingly, researchers have shown that there are real, physiological benefits to cultural participation. Singing in a choir, for instance, can improve health outcomes for people with chronic lung diseases. Participating in art therapy, experts are saying, can reduce trauma for those suffering from post-traumatic stress disorder. Governments across Europe and the world are realizing that there is an untapped, low risk, and often highly cost effective health and well-being benefit to cultural participation. In this seminar, three international experts will discuss the health effects of cultural participation and the potential of using arts and culture to improve health and well-being. They will explore how culture and arts are used in health promotion, examine how cultural participation affects health and well-being, and discuss the challenges and benefits of deploying arts and health policies. You can also ask questions via Slido: go to Sli.do website to send your questions to the speakers. If you are unable to join the live seminar, you can put questions to the experts via the WHO/Europe Facebook page.